I have some recently sewn things to share with you! I have quite the queue of sewing projects all the time. Some are for my local classes and many are things my family asks me to make for them (costume time is coming!!! ), but I always try to fit selfish sewing projects in between the selfless ones. I didn't get a good photo of the back, sorry. But it's pretty, I love the cut out! And I didn't make the skirt quite as full as the pattern, I just cut the width of my rayon, placing the stripes vertically, then pleated it to fit the bodice. I also elasticized the waistline seam allowance. Someday in the future, I may shorten it, but for now, it's super comfy and I like it. Next, none of these pieces are things I've made super recently, but they tend to get a lot of rotation in my wardrobe and I've never shared any of them here, so I think it's time! The cardigan is one of two Blackwood Cardigans I've made so far and I LOVE them. I have plans for a green one in a rib knit from Girl Charlee. 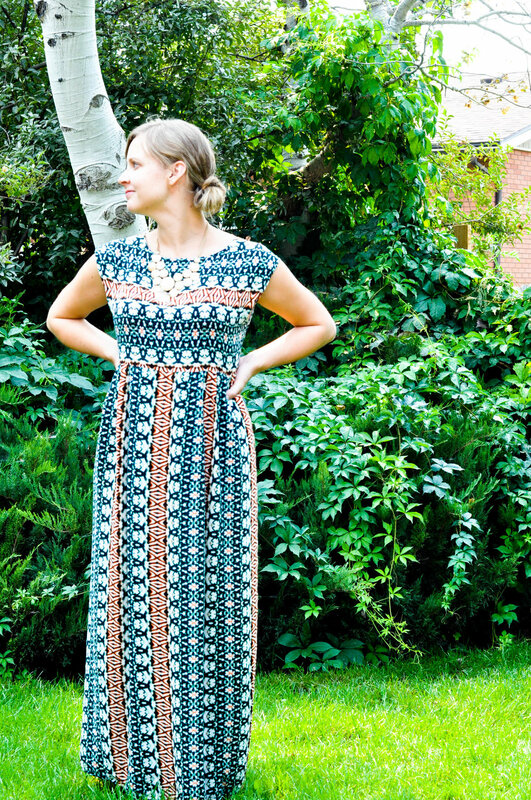 I only buy Indy patterns if I feel like I'll get several makes out of them and this is definitely a favorite! The skirt is the Chi-Town skirt, another Indy pattern I've managed to get quite a bit of use out of! I think the denim is part of it's success, though, I happened to pick it up at my Hawaii Fabricmart and it's a good one. Wish I could get more! The tank was self-drafted from a ready-to-wear tank that shrunk to oblivion (eye roll). I like the print for Fall! As a side note, let's talk about shoes for a minute. I have a bit of scoliosis and discovered after buying my first pair of Chacos a couple years ago (I have some like these and some like these) that shoes make a HUGE difference in how my back and hips feel. I need firm soles, with good arch support. Chacos are my favorite and I plan to order a pair of Chaco boots pretty soon, since I have moved to a state where sandals are seasonal, haha. But I've been checking Savers for nice shoes that can get me into Fall. Good shoes are expensive and if you aren't sure they're going to work for your issues, it's hard to spend that kind of money to just try them out, ya know? Anyway, I found the Sperry Topsiders (similar pair here) in the photo above at my local Savers thrift store and they are GREAT! They were in super good condition, they're real leather, which means my feet neither sweat nor get cold in them and they have the proper arch support. If you are super picky about shoes or have back/foot issues, can you recommend some more brands I can try? I haven't needed winter shoes in three years, so help me find some stylish ones! *This post contains affiliate links, which means that while I'm not paid to recommend products to you, I am earn a small percentage for referring you to items I love when you purchase through these links, which helps keep this operation going. While most of my sewing stuff is still in boxes while we wait for the remodel to be done, I did manage to make a dress yesterday and it felt soooooo good to sew something! It's like therapy, for real. I used a very simple shift dress pattern that I knew the fit was perfect on (I had made a muslin of it in the past), McCall's 2632. It's out of print now, but here it is on Amazon. Here's the dress unbelted, but I like it a little better with a simple belt, as shown in the other photos. Unfortunately, I could not get my serger working! I'm hoping I just made a threading mistake and it didn't get banged up in the move, but I didn't want to spend too much time on it so I finished my inside seams the old-fashioned way. I thought I'd share with you how to do the same! If you are making clothing for yourself, or your kiddos, or your dolls and you don't want the seams to get tattered in the wash, here are two ways to finish them so they'll always look nice. First, a French Seam. Here's how to do it! 1. Place your fabrics WRONG sides together and sew in a 1/4" seam. Trim this down to 1/8". 2. Press the tiny seam to one side. This will help you get a crisp edge when you then fold the piece RIGHT sides together, encasing the first raw edge inside. Sew in a 3/8" seam. Your seam will then look nice and pretty, with the raw edges tucked away, never to be seen again. This is how I finished my center back seam. You can see I didn't sew them down to the main fabric, I kept that out of the way as I turned the tiny hems under. A good press and it looks so neat on the inside! I had enough of this fabric to cut out a simple top too, so I'll be working on that next. And hopefully I'll get my serger working, but there's something satisfying about finishing the insides this way too! I know I'll get a lot of wear out of this dress. Today I found a belt of Natalie's lying around and put it on with it. Gracie wanted to be in all the photos, she's a camera hog. For at least four years in a row, I have worn the same black lace top to Christmas service, so since I had the time this year, I decided to make myself a new dress! I pulled out a pretty black lace that my mom gave me and a pretty lining color that another friend gave me (thank you, Megan!) and got busy making Butterick 5706. I spent extra time on the fit and I tried a hand picked zipper for the first time. I am the worst at zipper application! I do better with invisible zippers, but this dress had too much bulk for that and since there were stripes involved in the lace, I hand picked it and it turned out great. My best zipper ever! Here is a good tutorial for the hand picked zipper. I think I achieved a nice fit and I felt great in at church on Christmas Day! I'm not sure how much I'll be able to wear it because things are so casual here, even at church, but I'm still glad I took the time to make something nice and it's good to have something sophisticated like this in my wardrobe. One of my Instagram friends suggested that this will work great in colder weather with tights and boots and a cardigan when we move from Hawaii, which happens to be in six months, when the Army life will be taking us to the Salt Lake City area! Any tips from Utah dwellers on the area? Do you find it worthwhile to take the time to sew nice things that you may not get a lot of chances to wear? Props to my photographer Layla and our furry assistant. I have a crazy busy week coming up. I was really stressing over it and asked Casey to talk me back from the ledge and he suggested some sewing time. Ha! He gets me. Gotta make time for personal sewing, it's like therapy. I won't beat around the bush. I made a dress and I love it! If you're a quilter or are familiar at all with designer fabrics, or have shopped at JoAnn's at all, you may have noticed that this is a well known Denise Schmidt print. However, it's a rayon. I was at Hawaii Fabricmart and there miraculously appeared an entire wall of gorgeous rayons like this one! I swear it wasn't there before, there's no way I would have missed that for two years running. Anyway, I wasn't aware Denise Schmidt prints came in rayon, there was no info on the selvedge NOR on the end of the bolt. Which means it's quite possible this is a blatant knock-off of her work. Does anyone know if rayons were made in her prints? 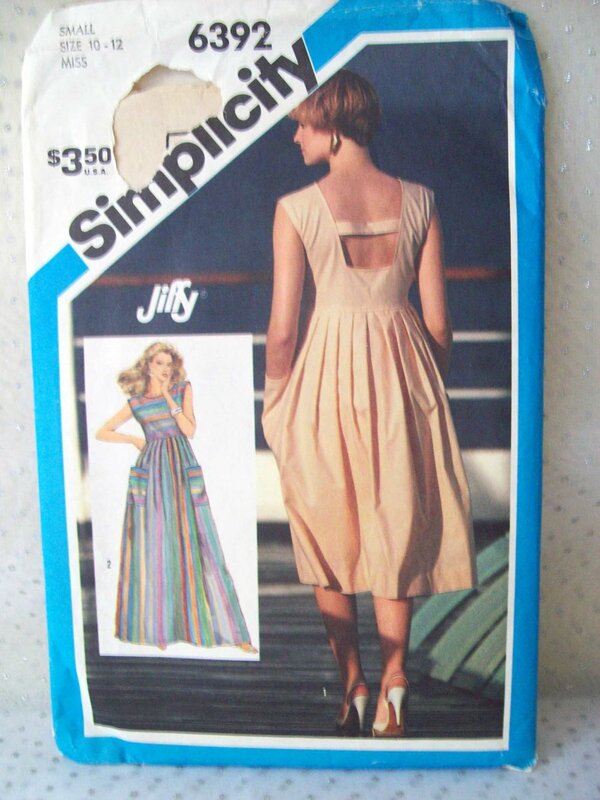 At any rate, I wanted to make a swingy summer dress and I had McCall's 6954 in my stash. I made the small and since there are four seams (front, back and sides), it was easy to adjust for more space in the bust. I have a history of making things too big, so I'm working on that and this size was perfect. It has so much movement to it, it's very comfortable and my husband really likes it! And, of course, it's looseness is a plus in my climate. It has been hot! These were taken outside my house. Don't hate me for my beautiful view. I promise it's leveraged by epic traffic! I plan to take this dress on my coming anniversary trip to the Big Island! I can't wait! I have made a top from this pattern and love it and wear it all the time. What I love most about it is the fit of the neckline and arms, so I knew I wanted to try to modify it into a dress someday. That day was yesterday! I slashed and spread the pattern pieces at the waist in order to create more of a tent dress shape on the bottom and then added length. Thankfully this worked beautifully, because I don't often take the time for muslins, ha! When I got to the hemming stage, I wanted to do something a little different and thought the slight high-lo would look cute. I feel like, with a semi-shapeless dress, making it too long just overwhelms me and looks frumpy. So I wanted it short enough not to do that, but also I wanted length enough in the back not to have to be sooo careful when I bend down. I think I covered my bases and it looks great! This is a keeper pattern for me, even though it's in several pieces now, haha. I hope to finish a few more projects this week before my next round of sewing camps starts. Until then, Happy Independence Day, America!